Mahindra TUV300 Plus Price Officially Revealed; Costs Rs 9.69 Lakh.Mahindra has now officially announced the price of the TUV300-based MPV called the TUV300 Plus. Available in a single P4 variant, it is priced at Rs 9.69 lakh (ex-showroom Delhi). The deliveries of the Plus are already underway. In fact, Mahindra had started it back in December 2017, way before it officially announced the price. 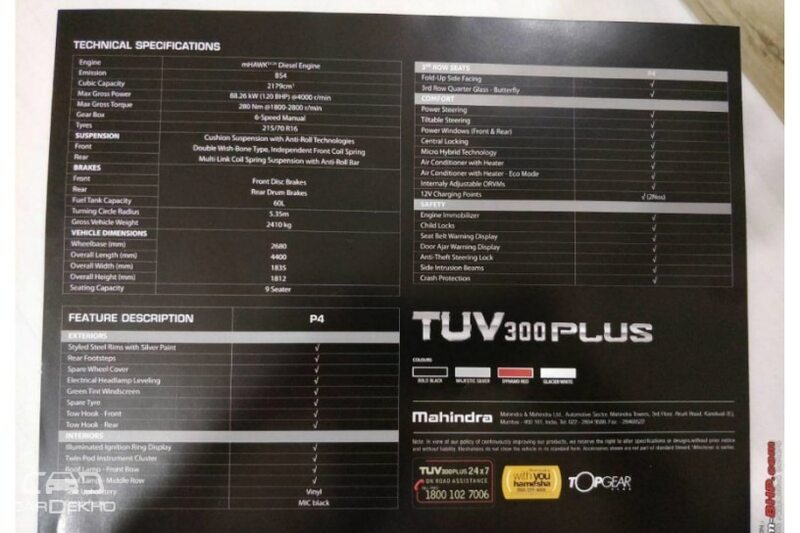 Mahindra is yet to unveil complete details of the long version of the TUV300, but thanks to a leaked brochure, we know quite a lot about it. 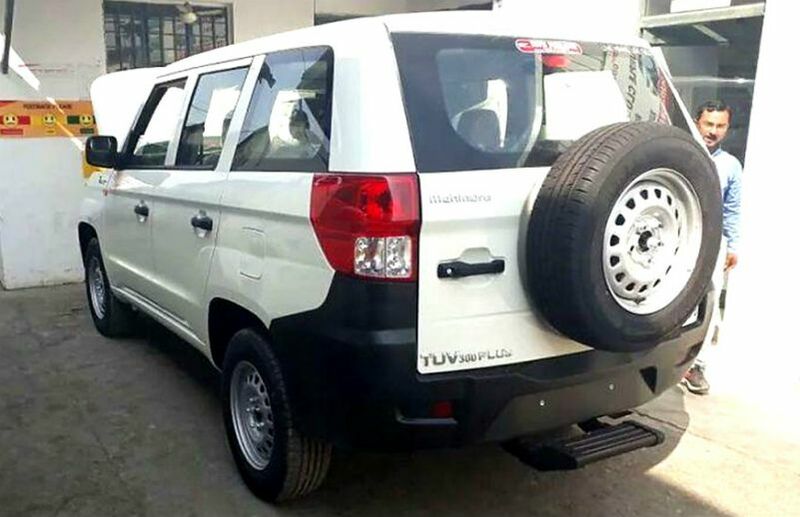 The TUV300 Plus is basically a 9-seater version of the sub-4m SUV TUV300, which is meant to seat seven. In the Plus, behind the second row, there are two rows of bench seats facing each other, that are meant to seat four. The seating formation in the TUV300 is also the same, with two seats (facing each other), behind the front row, for two adults. At 4,400mm, the TUV300 Plus is 401mm longer than the TUV300. However, its width and wheelbase remain unchanged at 1,835mm and 2,680mm, respectively. The Plus’ rear has been redesigned. It also gets larger 16-inch wheels against the TUV300’s 15-inch ones. The Plus is expected to replace the Xylo, even though the latter is still on sale. The TUV300 Plus is 120mm shorter, 15mm narrower and 93mm lower than the Xylo. At 2760mm, the Xylo’s wheelbase is 80mm longer. Available in multiple variants, the base-spec Xylo is targeted at fleet owners, while its top-spec variants cater to private buyers. The TUV300 Plus, on the other hand, has been introduced as a variant of the TUV300. And given its limited feature list, it is certainly here to meet the demands of fleet owners only. The TUV300 Plus is powered by the 2.2-litre mHawk120 diesel engine that also powers the Xylo. It makes 120PS of maximum power and 280Nm of peak torque, same as the Xylo, but 20PS and 40Nm more than the 1.5-litre mHawk100 diesel engine found in the TUV300. Both the TUV300 and the Xylo get a 5-speed manual transmission, but Mahindra is offering a 6-speed manual transmission on the TUV300 Plus. For better fuel economy, Mahindra has also equipped the TUV300Plus with micro-hybrid technology, which employs regenerative braking and auto start/stop function. The TUV300 Plus gets basic equipment such as tiltable power steering, all four power windows, manual AC, internally adjustable ORVMs and two 12V charging sockets. On the safety front, the TUV300 Plus is barely equipped. It even misses out on basic features such as dual front airbags, ABS and ISOFIX child seat anchors. All it gets for safety is engine immobiliser, seat belt warning, door ajar warning and child locks. Even the Xylo misses out on basic safety equipment like ABS and dual front airbags in its D2 and D4 variants. Mahindra has priced the TUV300 Plus at a premium of Rs 1.4 lakh over the base-spec TUV300 which retails for Rs 8.25 lakh (ex-showroom Delhi). It is also more expensive (by Rs 60,000) than the larger Mahindra Xylo, which is priced from Rs 9 lakh to Rs 11.8 lakh (ex-showroom Delhi).